Piran is a former possession of the City of Doges, which explains its Venetian atmosphere. It contains some beautiful architecture, including a replica of the Campanile in the Piazza San Marco. This charming little coastal town has preserved its medieval ghetto square, Zidovski Trg, which can be entered through an arcade. 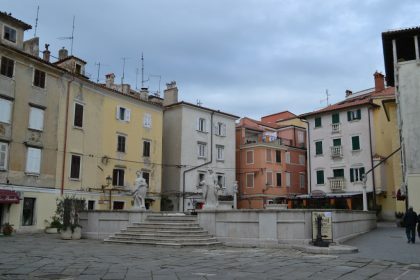 The square is surrounded by several multistory houses that undeniably resemble those of the Venetian ghetto.